Falcons are deeply rooted in Dubai’s history, and are regarded as cultural icons throughout the UAE. In fact, they’re so highly regarded that images of falcons can be seen on street signs, local currency, and are even the national emblem of the UAE. At Platinum Heritage, we offer a wide variety of professional falcon shows and experiences on the majority of our Desert Safaris. Our experiences range from private falcon shows, to an interactive birds of prey show, and even a hot air balloon ride with the world’s only in-flight falconry demonstration. In this quick guide we tell you everything you need to know about falcon shows in Dubai. This will give you a better idea of the different types of falcon shows offered on our Desert Safaris. Traditional falconry demonstrations are offered on several of our Desert Safaris. As with all of our falcon shows, our traditional falconry provides a glimpse into the rich history falcons have within this region. You will get to see how the falconers train these majestic creatures to fly and swoop for lures. Once the falcon catches the lure in the sky, they are rewarded with their favorite snack, usually quail. After the show, guests get great photo opportunities holding the falcon on the glove. Falconry is an ancient art that has been practiced for thousands of years, but the techniques used have evolved greatly in recent decades. 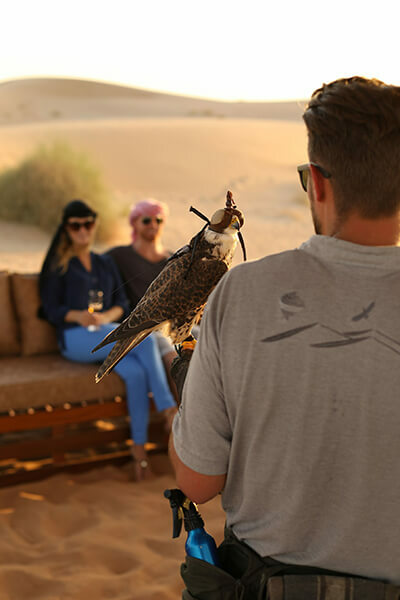 To give guests exposure to both the old and the new, we provide a modern interactive falconry demonstration on two of our Desert Safaris. This includes demonstrations of the traditional, as well as modern techniques used to train the falcons. Hi-tech equipment like high end drones are used in modern times to keep the falcons fit. On this experience, guests watch falcons reach speeds up to 300km/h as they fly and soar the skies around the drone. These are very interactive falcon shows, and are great for anyone interested in seeing how falconry has evolved over the years. Hunting with falcons is banned in most areas within the UAE, but the locals still keep them as companions, and often consider them members of the family. This bond is displayed first-hand in our Bedouin falcon show, which is a truly authentic falconry demonstration that is conducted by an Emirati falconer. The Bedouin falcon show is part of the Bedouin Collection of experiences. This is the most traditional falcon show, and incorporates many aspects of Bedouin life into a fully immersive experience. 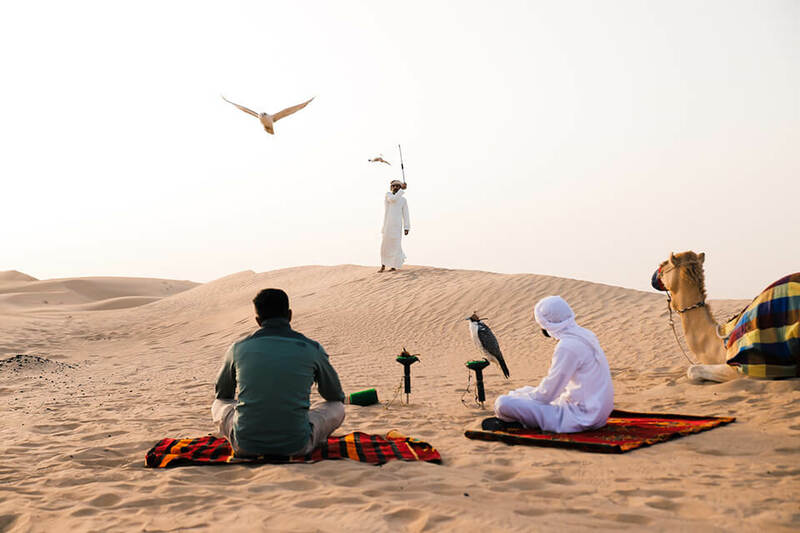 The falcon show is conducted by an Emirati in the Al Marmoom Desert Conservation Reserve. Guests travel on camel caravans through the desert and reach a point where they hop off and unroll the carpets carried by the camels as a place to sit and watch the show. This is a slightly less structured show and guests are encouraged to ask lots of questions. Although falcons tend to get all the attention, there are actually several birds of prey species native to Dubai. Birds such as hawks, eagles, and even owls can be found throughout the region. Our Falconry & Interactive Birds of Prey Shows are very engaging demonstrations that allow guests to get involved in the experience. This falcon show is slightly longer than the other falcon experiences, and is for people who have a keen interest in not only falcons but also other birds of prey. In addition to a standard falcon show, you also get to watch other birds of prey like Harris hawks and Desert eagle owls perform aerial tricks. You can even get the chance to fly a hawk to your own glove! Falcons in Dubai can be seen as a status symbol, with some selling for as much as 1 million dirhams. Due to this, falcons are often associated with luxury and class. To highlight the elegant side of falconry, several of our luxury desert safaris include an exclusive falconry experience. Our Platinum Collection offers very exclusive falcon shows with small groups, and even the option for a completely private falcon show. These falcon shows are best suited for people looking for a more high end experience, that still allows them to learn about the cultural significance of falcons within the UAE. 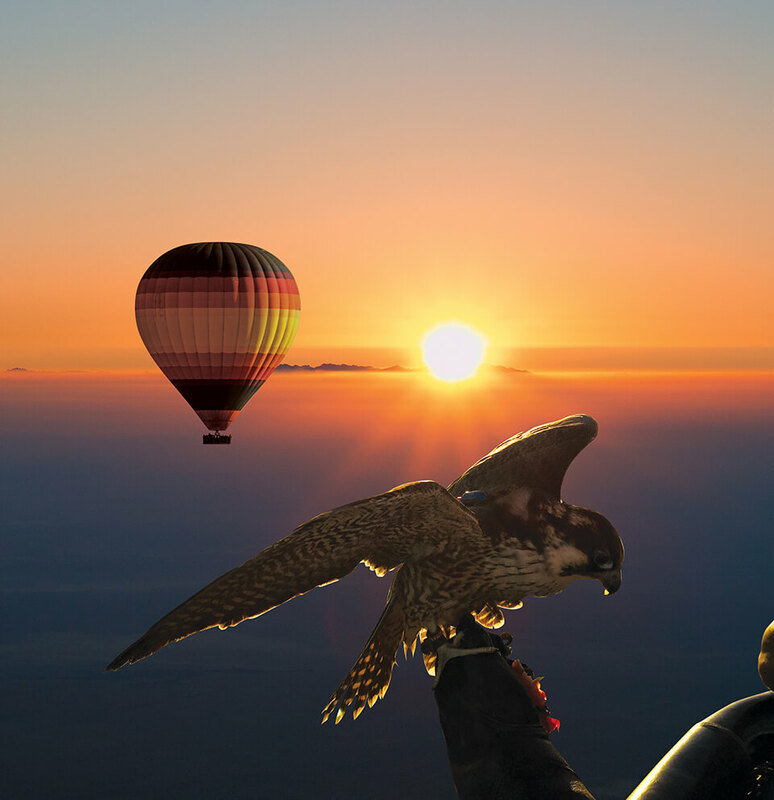 We are proud to be the only company in the world that offers an in-flight falcon show on a hot air balloon. Sharing the skies and balloon basket with falcons is the most unique falconry experience in Dubai – there’s nothing else quite like it! During this experience, you go on a beautiful hot air balloon ride above the Arabian desert as the sun rises. At 4,000ft midway through the flight, the falcon is released and soars the golden blue morning sky circling the hot air balloon baskets. 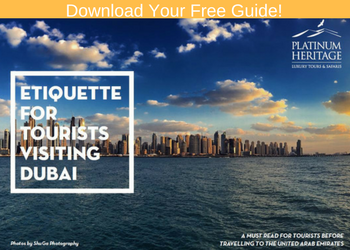 This experience provides the best photo opportunities in Dubai and is truly a once-in-a-lifetime experience! Why are falcons so important in Dubai? The significance of the falcon in Dubai goes back thousands of years. Before Dubai had the amazing falcon shows that we know today, these captivating birds were actually used by the Bedouin people for survival. Hunting for food was a part of the Bedouin people’s everyday life, and the falcon played a huge role in the way they hunted. By capturing and training falcons, they were able to hunt much more efficiently during the winter months. Falcons would help find and kill animals such as hares, birds, and gazelles, which were major food sources for the Bedouin people. What’s interesting about the relationship the Bedouin people had with their falcons is how short lived it was. The falcons were caught and tamed over a period of weeks as they migrated south from Iran to Africa every winter. Once the weather began to warm up again, they were released back into the wild. The deep rooted relationship the Bedouin people shared with falcons is a fascinating part of this region’s history, and experiencing an authentic falcon show first hand truly gives you a glimpse into the past.